Many of the same concerns regarding the well-being of the Bluenose caribou herd in the Berger Inquiry are still being discussed today due to continued industrial exploration, specifically regarding oil and gas, in the Northwest Territories and the Arctic. Since oil and gas are still valued resources in our current societies, exploration continues in the North, as described by Anne Dunn and her colleagues in the 2009 Arctic publication. These concerns include changes of habitat due to the introduction or industrial development such as roads, oilfields, mines, etc. The attraction of job opportunity to areas surrounding the Bluenose caribou herd could potentially cause an increase in demand of caribou meat. Increased income as a result of employment for industrial exploration allows for the advancement of hunting methods regarding the locating of caribou and utilization of year-round roads implemented originally for industrial exploration. The concerns regarding the Bluenose East and Bluenose West caribou herds of the Northwest Territories result specifically from oil and gas exploration (Gunn et al. 2009, iii). Besides industrial exploration, there are concerns about the population and survival of the Bluenose caribou herd surrounding climate trends. Specifically, warmer temperatures will affect the environmental conditions in which the caribou rely on for sustenance. An increased temperature in the wintertime could correspond to more freeze-thaw cycles (Gunn et al. 2009, iii). Regarding population size, according to the Arctic journal, “migratory wild reindeer and caribou numbers have dropped by about one-third since populations peaked in the 1990s and early 2000s”. 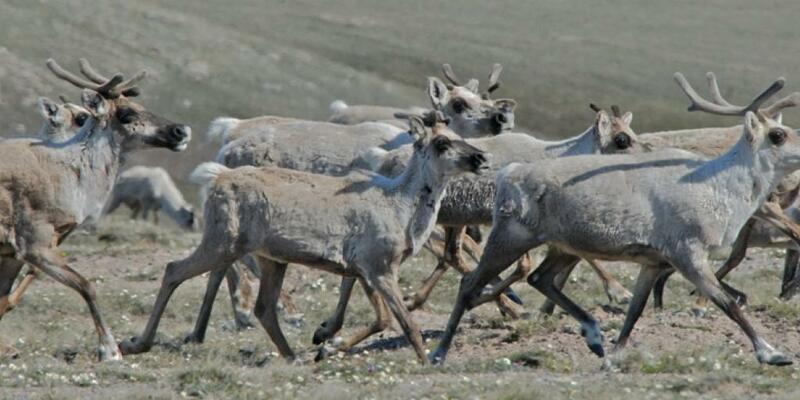 There are natural periods of abundance and scarcity among migratory tundra caribou herds. These increases and decreases in population size are likely results of “continental climate switches” (Gunn et al. 2009, iii). According to the Northwest Territories Environment and Natural Resources division, the Bluenose West caribou herd was estimated to have population of 112,000 in 1992. In 2015, its population was estimated to be approximately 15,000. The Bluenose East caribou herd was estimated to have a population of 104,000 in 2000. In 2015, its population was estimated to be between 35,000 and 40,000 (Northwest Territories). Gunn, Anne, Don Russell, Robert G. White, and Gary<br> Kofinas. "Facing a Future of Change: Wild<br> Migratory Caribou and Reindeer." Arctic 62, no. 3 (2009): Iii-Vi. http://www.jstor.org/stable/40513303. Northwest Territories: Environment and Natural Resources. "Barren-ground Caribou: Northern Herds." Environment and Natural Resources. Accessed March 08, 2017. http://www.enr.gov.nt.ca/node/2979.